David Abel has been entertaining audiences with his unique style of magic professionally for over fifteen years. He is equally confident performing in front of parties of over 500 people, as well as performing before small intimate groups. 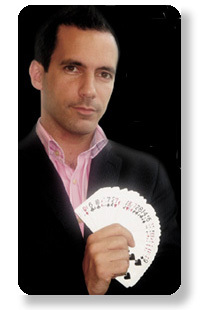 David has been a resident magician in several restaurants and bars in London. The five star Grand Hotel in Brighton, Astra Pharmaceuticals, The Eerie London Pub, the Loch Fyne Restaurants, and Outback Restaurants, are just some of his past clients. David is a member of the famous Magic Circle, as well as theLondon Society of Magicians, where he has won both theClose Up Magic and the Stage Magic competitions. For any information with regards to a potential booking, please don’t hesitate to get in touch. Consultations can be arranged.